Announcement Whimsical doll slings & teether necklaces to soothe babies or anxiety. Doll slings for toddlers and preschool children to carry their stuffed animals. 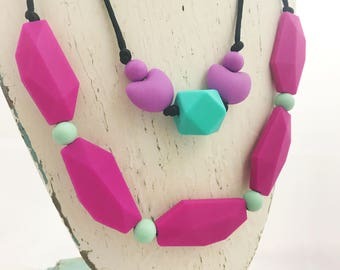 Soothing and stylish teething necklaces for babies or those with anxiety. 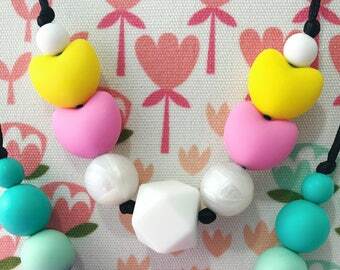 Awesome teething necklaces for hip mamas rock while soothing teething babies and toddlers! Double as sensory toys for baby! 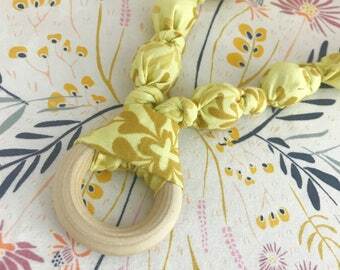 Choose from natural wood, securely sewn and tied in cotton fabric or BPA FREE silicone, safely knotted with breakaway clasp! All doll slings and teether necklaces are handmade with love & care in my home studio. Ready to ship within 24-48 business hours after payment is received! All orders ship First Class via USPS (approx 2-5 days domestic, 8-14 days internationally). I happily ship Worldwide! Please see my shipping policies for more info! Faster Shipping available, if you need your item sooner just message me! CUSTOM ORDERS are welcome! Want a certain fabric not currently in stock? 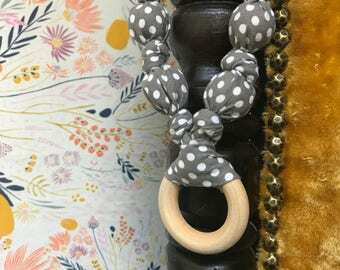 Coordinating doll sling and teething necklace? 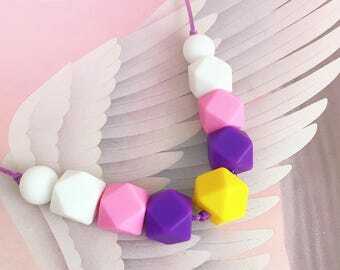 Message me and I'll order the materials and make your doll sling or teething necklace just for you and yours! Happy to make a larger doll slings for older children as well! (In stock doll slings fit most kids 1-7 years old). If you'd like a larger doll sling message me with your child's sash measurements and I'll make a sling just for them to carry their dolls with room to grow! Thanks for choosing to shop small and handmade! 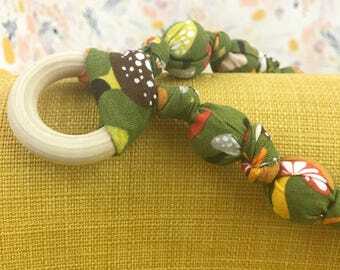 Whimsical doll slings & teether necklaces to soothe babies or anxiety. Absolutely adore the necklace. Thank you so much. I get so many compliments on it. Very good quality and I love the colors. So sweet and pretty! It made a perfect gift for my sweet sister in love. So cute and a big hit! 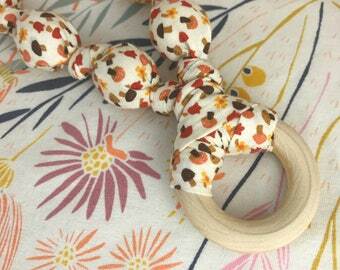 Whimsical Toy Ring Slings, Doll Carriers for your little loves to wear their "babies" just like mommy wore them! Welcome to Burrow & Bloom! 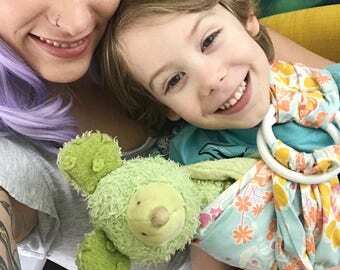 Burrow & Bloom is inspired by my son, my journey into motherhood, and my desire to create and share the love, in the form of gorgeous and fun nursing necklaces and doll slings, with other moms and their little babies and toddlers. I live with my family in lovely central Florida. Doll slings allow toddlers and young children to carry their baby dolls like mom or dad! Adjustable ring slings made with cotton fabric and nylon sling rings make a special big brother or sister gift! Kids can wear their babies while running and playing, in front or on their backs, keeping them clean and close. Gentle parenting win! Burrow & Bloom doll slings fit most children 1-7 yrs old! 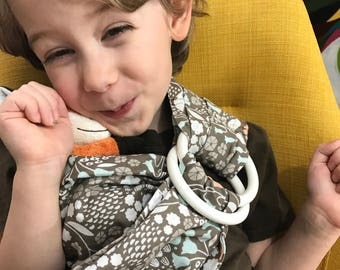 While sewing necklaces one afternoon, my little one needed something to play with, so I grabbed a couple rings and a wrap scrap and made him a little sling. When I asked if he wanted to carry his baby, just like mommy, he was absolutely elated! He proudly carried his toy froggy back and forth through the house! This pure joy just had to be shared with other little children and their families! Selecting gorgeous fabric, crafting it into something charming and useful and sending it forth to other moms and their little ones, infused with love and care, is a passion of mine. 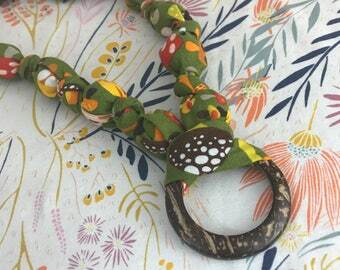 Each doll sling and teething necklace is made by my hand. 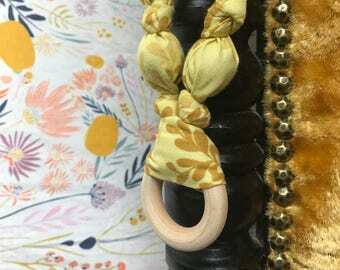 Using fabric brimming with both modern and retro nature motifs on soft fabrics and colorful geometric silicone chew beads, I create, photograph, edit, list, ship, and blog. 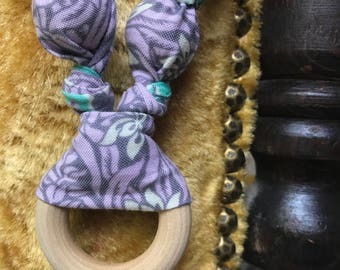 Burrow & Bloom is inspired by my journey into motherhood and desire to share beautiful necklaces and slings with other moms and their little ones. 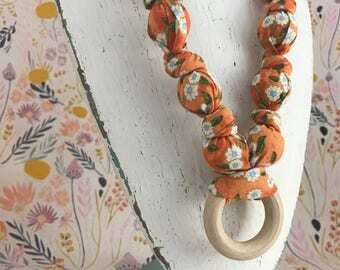 Doll slings and teething necklaces in luscious colors & whimsical flora and fauna on soft fabrics! Custom orders are welcome! Want a certain fabric not currently in stock? Have a special color scheme in mind? How about a coordinating doll sling and teether necklace? Message me and I'll order the materials and make something just for you or your little one! Also happy to make larger doll slings for older children as well. (In stock slings fit most children ages 1-7 years old).